In three weeks, legions of loud bros with questionable Irish ancestry will rise up to drink Guinness in the name of St. Patrick. 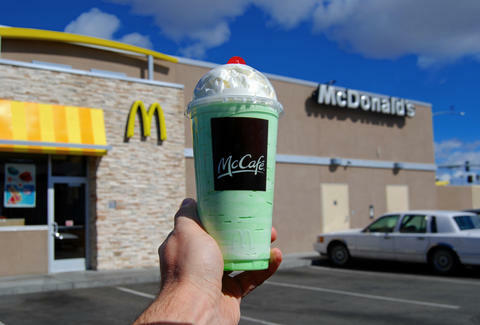 Providing the perfect pregame is McDonald's, which recently brought back the Shamrock Shake. The seasonal fan-favorite has been around since 1970, but it didn't truly become an institution until 1974, when the Philadelphia Eagles teamed up with the chain to help some sick kids and, in the process, launched a charity powerhouse. Former Eagles tight end Fred Hill was trying to help out the families of children with leukemia at the time -- he was unfortunately very familiar with their predicament, as his daughter Kim had been battling the disease since the age of 3. He and his neighbor Stan Lane founded a charity called Eagles Fly for Leukemia (with support from the Eagles owner himself, Leonard Tose), but they weren't sure of the best way to use their funds. That's when a doctor at the Children's Hospital of Philadelphia, Audrey Evans, suggested buying a house near the hospital to provide lodging for the parents of her young patients. Hill and Lane got in touch with local McDonald's franchisees through the Eagles GM Jim Murray and offered this proposal: quarterback Roman Gabriel would promote their Shamrock Shake (conveniently already in Eagles colors) if a portion of the profits went towards the house. The company actually did them one better, and promised to donate all the Shamrock Shake money if they could name the place the Ronald McDonald House. As you might've heard, those are kind of a thing now. There are currently over 300 Ronald McDonald Houses in 52 countries or regions. And their rise is forever tied with the rise of the Shamrock Shake. Remember that the next time you feel guilty about slurping down two in one sitting. Kristin Hunt is a Food/Drink staff writer for Thrillist, and has had exactly one Shamrock Shake in her lifetime. Follow her at @kristin_hunt.